I recently found 2 damaged Triang Mk1 brakes for £1 each and decided to try and build a scale length Mk1 BG. 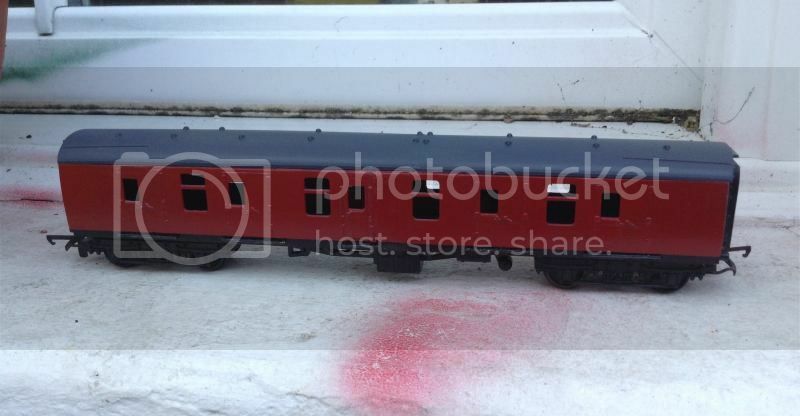 I used a Bachmann BG as a guide for cutting the sides, roof and chassis to size. I had planned to do this conversion with a too long Triang BG , but found it was just as easy to use the brake coach sides and fill in one of the doors. So far its been reasonably straight forward, although removing the molded line along the sides was a very tedious job. I'm about half way through now, and I've added foot boards under the doors with using thin strips of plasticard. The next step will be to add some detail to the roof and sort out the interior. This will probably come from the 2 donor coaches. Last edited by Ken Shabby on Tue Apr 05, 2016 12:21 pm, edited 1 time in total. Some more progress over the weekend, flush glaze windows are now fitted and annoyingly a couple popped out when the roof was refitted . The periscopes have been added to the roof using tiny scraps of plastic and it now awaits some oval buffers. I'm trying to think of a way to add bars to the windows, maybe drawing them onto clear plastic with a very thin black marker and mounting them behind the flush glaze windows?. Much tidying to be done, but I'm quite pleased with how this is turning out. The sides are very thin hard board from a picture frame, the rest is cardboard from a old Lima coach box. It is strengthened with lolly sticks and the shop interior is a small block of Duplo Lego. 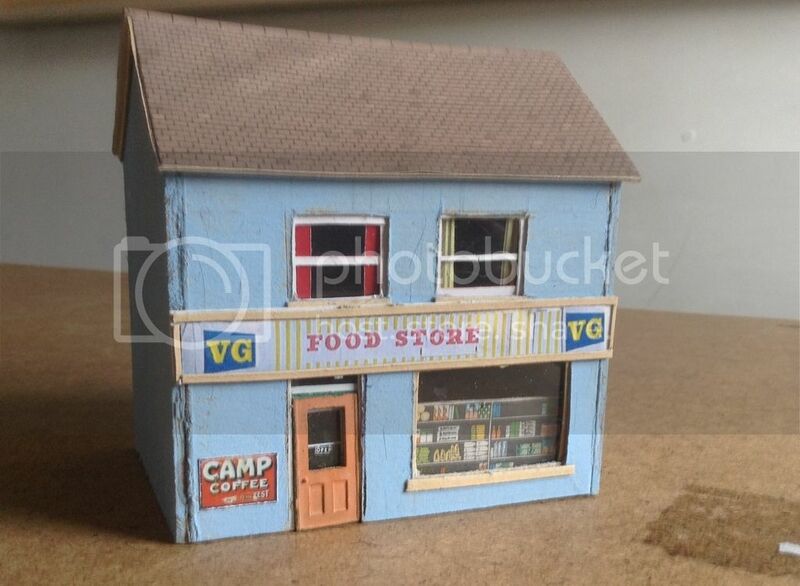 The shop display came from a ruined Superquick kit and the door from a Peco station kit. The next step will be the drain pipe and guttering. 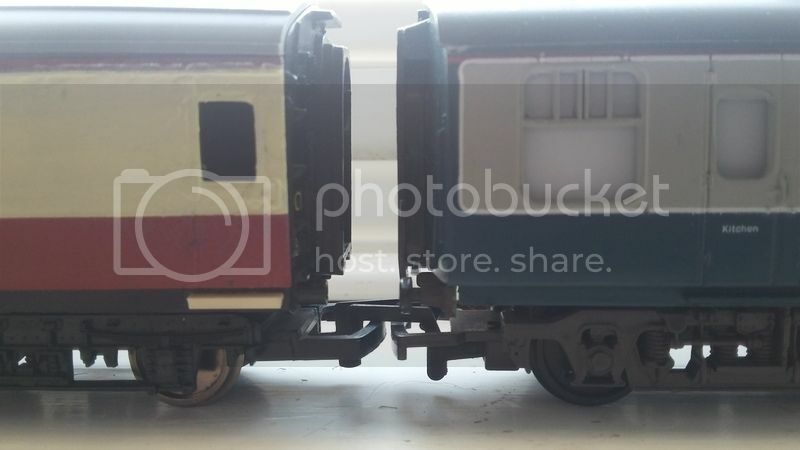 More fun with dirt cheap Mark 1 coaches . This one is going to be a fictitous prototype careteria car coach, hence the filled in windows at one end. The other side is unchanged and the interior will be 3 of the original compartments and a scratch built open area with a counter and seating. 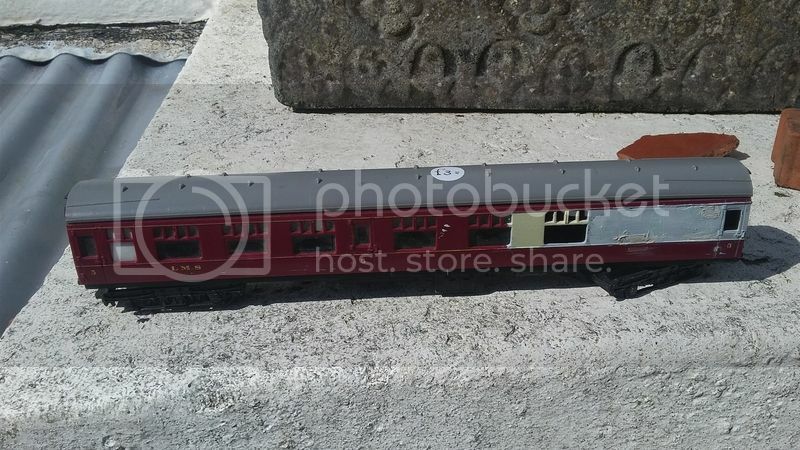 Livery will be carmine and cream and I will be attempting to lower the ride height so it does'nt tower of my more modern coaches. Much work remains, not sure I've I will be able to stand flush glazing it though. That's a nice job and what a coincidence! I was trying to do a very similar conversion on my layout thread at almost exactly the same time . More progress with the fictitious cafeteria car , the coach has now been lowered so that It won't look too out of place amongst my other stock. 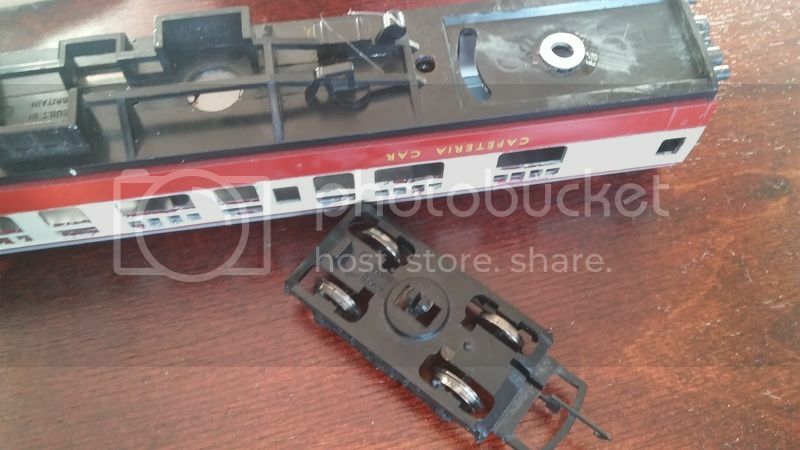 To do this I cut through the brass rivet and chucked the bogies in the spares box, and used the later style of push in bogies that Hornby used on all of it's LMS, GWR, SR coaches for years. The hole where the old bogies were attached were filed flat and a washer was glued over the hole , the new bogies were a easy push fit. A few test runs were made with the rolling chassis in various positions in a rake of coaches and no derailments occured. I have started adding footboards under the doors and need to get another can of Ford Rosso red from Halfords, as you can see some tidying up of the paint work is required. 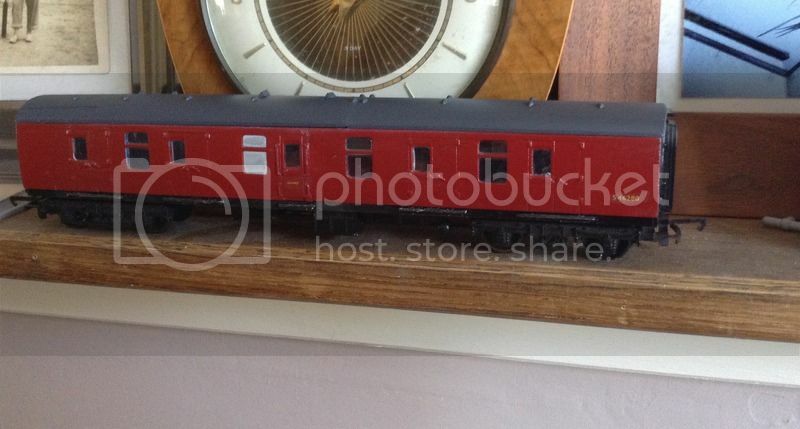 Coupled to a Mainline restaurant coach , with footboard fitted. Sorry I've only just read your post . I have cut up some Clerestory coaches in the past, although not to lengthen them. instead I did quite a common conversion and cut windows in the end to produce a pre grouping Southern push pull set. To do this I very carefully cut the coach end out so I could cut the window openings with it laid flat. I then glued the modified end back into position. 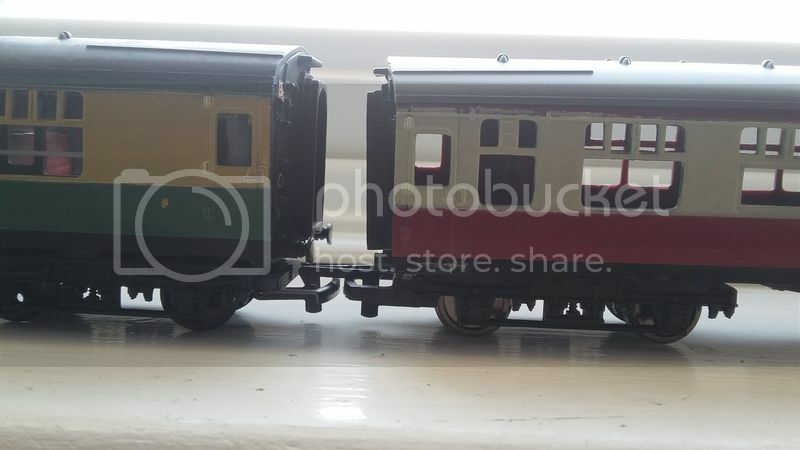 I had no trouble with anything breaking and the coaches were originals from the 60's and not the more recent reissues, so unless the coaches have been weakened by sunlight you should be okay to start cutting. Maybe a block of wood inside would help support everything during cutting and stop the body bending. One problem with these coaches I've never fully solved is converting the clerestory roofs to give them a more LBSC/SECR/LSWR look. I've tried various methods including joining the roofs of 2 and a half of the old Hornby KitKat/Smiths crisps vans, but they've never looked quite right.